PROGRESS, as defined by the Merriam-Webster Dictionary, is "the process of improving or developing something over a period of time." As Porter County and Northwest Indiana developed, old Indian migration trails were transformed into roadways. Such roads as Indiana State Road 2, U.S. Route 12 (Dunes Highway), and U.S. Route 30 now traverse a substantial portion of these Indian trails. Progress continued as petitions were regularly presented to the Porter County commissioners from settlers and their descendants requesting that new roads be surveyed and constructed to facilitate less laborious and costly transportation. Today's U.S. Route 12 followed the Old Chicago Road. Initially a simple foot and horse path, it later developed into a wide and well worn dirt road that was subsequently graveled. By the late 1910s, the automobile was experiencing rapid adoption across the United States; the quality of roads at this time, however, was not keeping pace. The Dunes Highway Association, a group of citizens focused on road improvement, proposed that the Old Chicago Road be upgraded with the installation of a forty foot wide concrete roadbed and renamed the Dunes Highway. Construction of a concrete roadbed was started in 1922, but the width was set at twenty feet instead of the proposed forty. The Dunes Highway at this time was designated as Indiana State Road 43. East of Michigan City was a highway designated as Indiana State Road 25. This road was later renamed U.S. Route 20 in 1926. West of Michigan City, U.S. Route 20 and Indiana State Road 43 (today's U.S. Route 12) shared the same roadbed. Members of the Dunes Highway Association were prescient with regard to a wider roadbed. The volume of traffic on the twenty foot wide portion of highway west of Michigan City to the Indiana-Illinois state line was overwhelming. This highway was receiving westbound traffic from both Ohio and Michigan, as well as eastbound traffic from a rapidly growing Chicago and Lake County, Indiana. Traveling on U.S. Route 12 today, it is difficult to imagine traffic jams on this road as it traverses Porter County. Due to very heavy usage of the Dunes Highway, the Dunes Relief Highway was constructed during the early 1930s, closely paralleling the Dunes Highway. The Dunes Relief Highway was built with dual lanes to carry more than four times as much traffic, about 40,000 vehicles daily, as the Dunes Highway could carry. The Dunes Relief Highway was designated as U.S. Route 20, and the location of its roadbed has not changed since it was constructed in the 1930s. Progress continued in Porter County, Lake County, Chicago, and in areas east of Porter County. By the late 1940s, it was clear that U.S. Routes 12 and 20 could not handle the volume of traffic crossing the northern portion of Porter County. Officials of the federal government were also keenly aware that highway infrastructure improvements were needed nationwide to facilitate the movement of goods and people. Legislation was passed by the Indiana General Assembly in 1951 to create the Indiana Toll Road Commission. After determining the route of the proposed road, ground was broken in September 1954 to build a dual lane divided (median) highway. Amazingly, the $280 million Indiana Toll Road project was completed in just 786 days (November 1956). However, construction did not go without incident in Porter County. by the Indiana Toll Road Commission in 1962. Planning for major highway projects often results in some objections from landowners that would prefer not to lose their land. There were few landowner objections to the Indiana Toll Road in Porter County, and those owners that did object were mostly concentrated in western Portage Township close to the county line. Condemnation proceedings were brought against these holdouts and settlements between these landowners and the State of Indiana were agreed to rather quickly. A much larger issue associated with the construction of the Indiana Toll Road in Porter County involved an impediment to progress in Portage Township. When planners were establishing the route for the planned Indiana Toll Road, they used aircraft to visually survey and determine a course that would be as direct as possible and minimize costs of construction. While flying over Portage Township, Toll Road planners failed to notice a small cemetery in their "optimum path" located in the northeast quarter of the northeast quarter of the southwest quarter of Section 17, about 800 feet west of the northward flowing Salt Creek and one-half mile southeast of McCool. This was the James Cemetery. The James Cemetery's first burial occurred soon after the death of Mary (Brown) James on October 18, 1838. Portage Township pioneer Baruch Dorr was interred in the cemetery about two months later when he passed away on December 17, 1838. The cemetery was named in honor of Allen B. James, the original owner of the land on which the cemetery was established and the father-in-law Mary (Brown) James mentioned above. 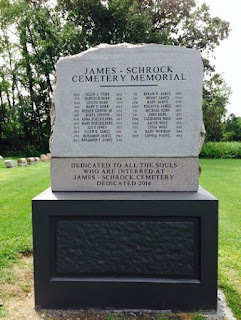 Occasionally, the James Cemetery is referred to as the Schrock Cemetery since the Schrock family later owned and farmed the land surrounding the James Cemetery. Surprisingly, the James Cemetery does not appear in any of the four major atlases of Porter County published in 1876, 1895, 1906, and 1921, though the nearby McCool Cemetery and Robbins Cemetery do appear in the 1895, 1906, and 1921 atlases. 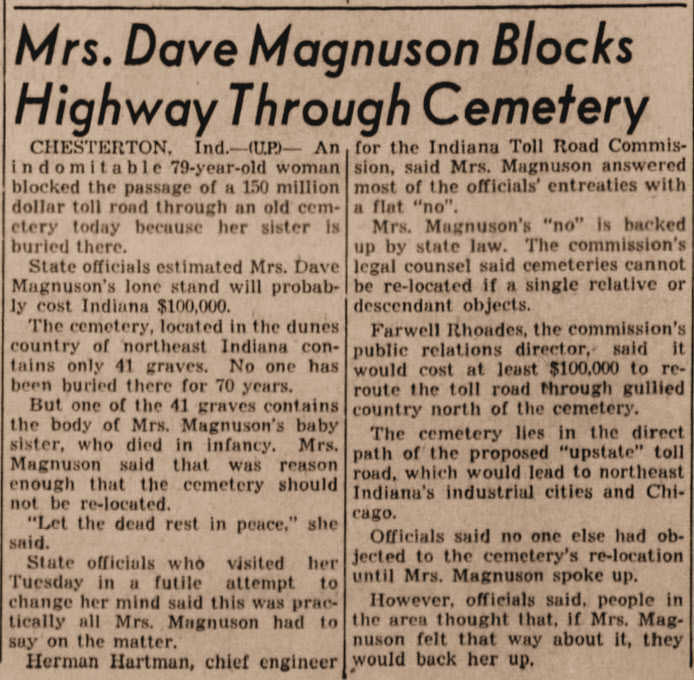 By the early 1950s when the Indiana Toll Road was being planned, the James Cemetery had not witnessed a burial since 1884 when Mary C. Worman was interred there after her death on January 1st at the age of 53 years. 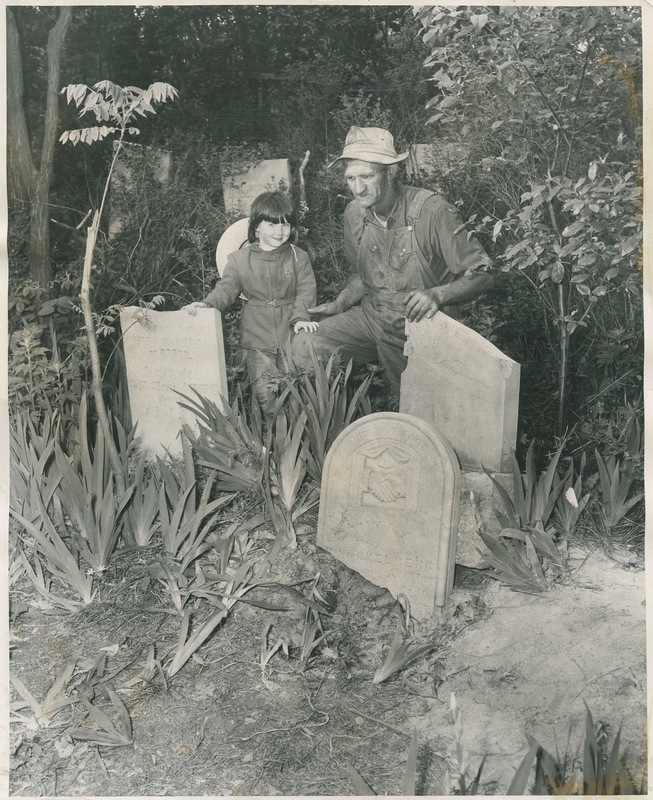 At some point in time after Worman's death, the approximately 60-foot by 90-foot cemetery fell into disrepair and became overgrown with trees, brush, and grasses. Thus, the cemetery was not readily visible when aerial survey work was being conducted to plan the route of the Indiana Toll Road. When metes and bounds surveys were being carried out to define the legal description of the Indiana Toll Toad, surveyors found that the James Cemetery was in the proposed roadbed's direct path. A heap of problems ensued once the James Cemetery was identified as a impediment to the construction of the road. The chief engineer of the Toll Road Commission, Herman D. Hartman, told the United Press at Indianapolis that the Commission would seek a court order to simply relocate the cemetery; a cemetery would not stop the progress of Indiana transportation. Soon after Hartman proposed a solution, objections were made to relocating the cemetery. Several newspapers throughout the country carried the story, providing details of the reasoning of the objectors. "I told them [engineers] they were in for a peck of trouble." Hamstrom also indicated in the same issue of The Vidette-Messenger that in 1938, while he was the Portage Township Trustee, he had a fence constructed around the cemetery and that woodchucks had invaded the graves. 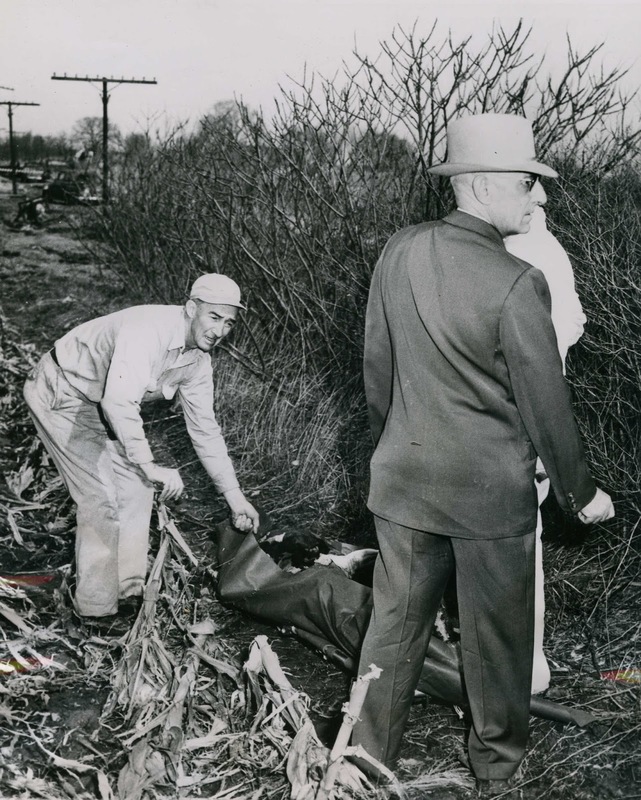 That "peck of trouble" referred to by Mr. Hamstrom was the prevailing Indiana public law concerning the disinterment of bodies located in cemeteries; in 1954, this law was nearly identical to today's law (Indiana Code § 23-14-57). Indiana public law provided that disinterment could not take place even if one relative objected to the removal of a body. One individual did object to disinterment and, despite the Toll Road Commission's positioning in seeking court approval to remove the cemetery, she held firm. That person was Mamie Augusta Fredericka (Hoeckleberg) Magnuson, age 79 and a resident of Chesterton. Mamie was the daughter of Bernhard and Mary (Krieter) Hoeckelberg. Mamie's sister, Mary Hoeckelberg, was interred in the James Cemetery when she died at the age of three in 1878. Though Mamie was born 15 years after the death of her sister, Indiana public law entitled her to object to the disinterment of her sister's grave. 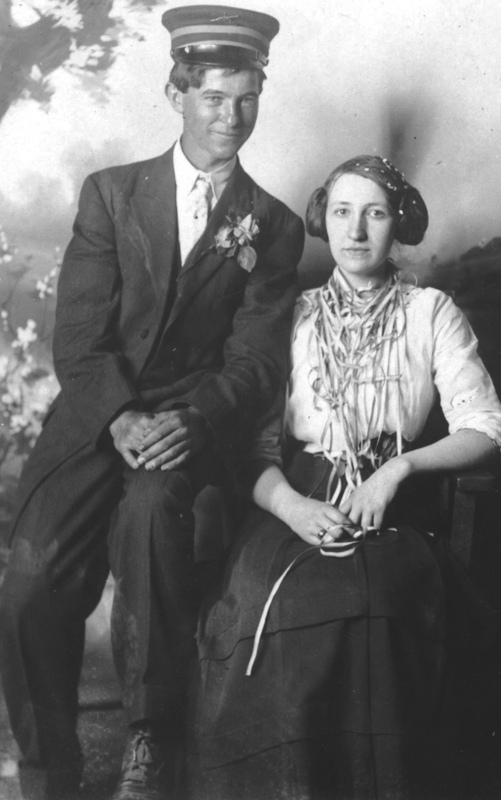 Photograph of David C. Magnuson and wife Mamie A. F.
Township during the survey and construction of the Indiana Toll Road. Source: William Taber (Find A Grave Memorial No. 5682598). "I certainly will object; and I'm sure my brothers and sisters will join me. I have a sister buried there, Mary Hockelberg, who died when she was a baby. I know the cemetery is run down and over-run with trees and weeds but I believe in letting the dead rest." Not everyone with a relative buried in the James Cemetery was opposed to having bodily remains disinterred and removed elsewhere. Elmer Lenburg, who had two uncles buried in the James Cemetery, supported the Toll Road Commission's position, indicating that the current location of the cemetery was poor and that a "better location" should be sought. Incidentally, Lenburg farmed the land surrounding the James Cemetery, which, in 1954, was owned by his mother-in-law, Mary (LaHayne) Schrock. construction of the Indiana Toll Road. Source: The Kane Republication, May 26, 1954. Mamie Magnuson's objection was quickly creating a serious public relations issue for the Indiana Toll Road Commission; Commission representatives learned of Mamie's objection through news sources. Within days of Mamie's objection, Herman D. Hartman, the Commission's chief engineer, Farwell C. Rhoades, a public relations representative for the Commission, and the Commission's land agent, Merritt Johnson, traveled from Indianapolis to Chesterton to visit with her, presumably to persuade her to drop her objection. way for the construction of the Indiana Toll Road. C. Smith on May 26, 1954, for the Chicago Sun Times. The three Commission representatives also visited the site of their trouble when they traveled north to meet with Mamie. 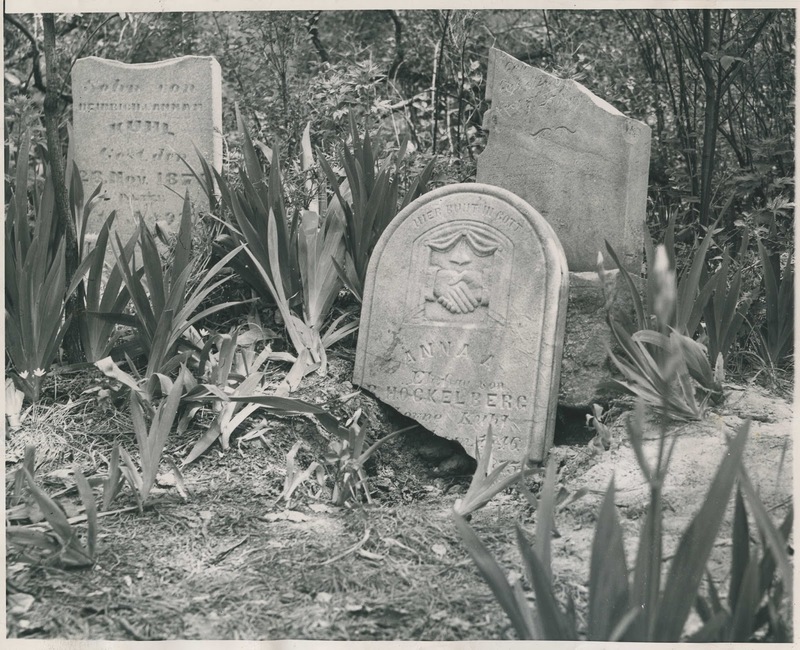 They reported that vandals had been destroying grave markers in the cemetery within the past week, including the tombstone of Mamie's sister, Mary Hoeckelberg. They also meet with William Albert "Uncle Billy" Briggs, to learn about public opinion regarding the removal of the cemetery. Briggs informed the visitors from the Commission that after more than 70 years of burial that it was unlikely that any remains would be found to remove; he stated that "the graves should remain as at present." Anna Hoeckelberg located in James Cemetery. Press International, Chicago Bureau on May 27, 1954 (ID Number HXPC-21297). Another objector appeared in the person of Catherine (Wise) Bortele, a resident of Pekin, Tazewell County, Illinois, whose parents Mary E. Wise and James Wise, as well as her sister, Roxanna Wise, were interred in the James Cemetery. Note that only Roxanna appears in any enumeration of burials for this cemetery. Likely due to Mamie Magnuson's objection and the negative press it was creating, as well as the rather clear stipulations in Indiana Indiana public law, the Indiana Toll Road Commission relented and relocated the path of the roadbed. Perhaps to disparage Mamie, however, the Commission informed representatives of the press that the relocation of the highway would cost $100,000 in order to accommodate Mamie's objection. This astounding figure must have caused some members of the press to seriously question the Commission's cost estimate. Within a week, a new roadbed relocation cost estimate was released by the Commission in the amount of $5,000. Thus, James Cemetery was saved from obliteration and today is located south of and adjacent to the Indiana Toll Road. bypass James Cemetery in Portage Township. Source: The Vidette-Messenger, May 25, 1954. "It [James Cemetery] is overgrown with weeds, underbrush and trees. Markers are down and broken. The ground is a sieve of woodchuck burrows. A trash dump, topped by a rusted auto body, is but a few feet away. Only access is by foot. C. W. Nelson, Porter historian for the State Historical society, told the Duneland Historical society that James cemetery has an 'historical significance.' Undoubtedly, that is true. But the condition of James cemetery is a black mark against Portage township officials and residents." Even after this indictment concerning the condition of the James Cemetery, very little was done by Portage Township officials over the years to consistently maintain the tombstones and the cemetery grounds, which is mandated by Indiana State Code for cemeteries under the management of a township trustee. Recently, this changed. Debbie Clem, Portage Township Cemetery Director, and Kathy Heckman of the Portage Township Historical Society led an effort to clean the cemetery, reset tombstones, and erect a memorial (in the neighboring McCool Cemetery) to those souls buried in the James Cemetery. James-Schrock Cemetery Memorial, dedicated in 2014. News reports from 1954 indicated that 41 individuals were interred in the James Cemetery. Current Find a Grave records identify 25 of these individuals, while a cemetery enumeration conducted by the Northwest Indiana Genealogical Society that was published in 1995 identified 19. Hence, it appears that 16 individuals buried in James Cemetery have yet to be identified; Mary E. Wise and James Wise, identified above, are apparently two individuals not included in any James Cemetery enumeration. The James Cemetery-Indiana Toll Road incident was not the first case of a cemetery impeding the progress of transportation in Porter County. When the Dunes Highway (U.S. Route 12) was widened to twenty feet and surfaced with concrete, numerous Native American burials were known to be interred immediately outside and adjacent to the stone wall of the Bailly Cemetery. As a result, the roadbed of the highway was moved slightly northward to avoid these burials. In addition, when U.S. Route 6 was constructed, it obliterated one of the first cemeteries established in Porter County, known as the Zane Cemetery. This cemetery was located in the northwest quarter of Section 26 in Liberty Township, north of County Road 775 North and south of U.S. Route 6. It is unknown if any burials at this cemetery were disinterred and removed elsewhere. It is known, however, that Martin Phares discovered a small tombstone for Austin Zane here, which was reportedly transferred to the Porter County Historical Society to maintain. Austin was the son of pioneers Asa Zane and Elizabeth (Whitaker) Zane; he died on May 16, 1838, at the age of thirteen years and seven months. When Indiana State Road 8 was cut through Boone Township, Native American remains and artifacts were uncovered within a sand ridge located on the line between Sections 8 and 17. The whereabouts of these remains and artifacts has been lost to time. 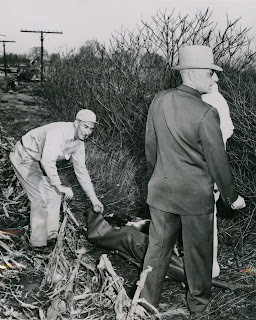 Regrettably, progress in transportation via the construction of the Indiana Toll Road in Porter County resulted in the death of five individuals on March 9, 1955, when an enormous natural gas explosion occurred at 9:45 am in the vicinity of Indiana State Road 49 north of County Road 950 North. The explosion was reported in newspapers from coast to coast. Crews were working in this area with heavy equipment. One task involved the relocation of a 10-inch natural gas line owned by the Wisconsin-Michigan Pipeline Company in order to bypass the Indiana Toll Road roadbed. Two bulldozers were operating at the pipeline site, one on each side of the new roadbed, placing backfill over the pipeline. One of these bulldozers struck and punctured the pipeline, resulting in a massive explosion and fireball. a pipeline due to the construction of the Indiana Toll Road. Source: The Vidette-Messenger, March 9, 1955. The following four workers at the pipeline relocation site were instantly killed: Clovis Franklin King, 42, of St. John, Indiana; Wilmer Miller, 48, of Crown Point, Indiana; Lester L. J. Lind, 45, of Detroit, Michigan; and Lester Kuhn, 45, of Crown Point. Three additional workers suffered injuries: Hunter J. Smith, 63, Kenneth McKay, 47, and Carl Manley, 25, all of Crown Point. Hunter J. Smith died later in the day at Porter Memorial Hospital as a result of the injuries he sustained. The force of the blast threw Clovis F. King's body more than 1,000 feet from where he had been working, while Hunter J. Smith's was found 1,500 feet away. hundred feet from site of natural gas explosion site. The huge fireball took over four hours to extinguish and was emitting flame from both sides of the roadbed. The danger of additional explosions was considered great enough that students at Liberty Center School, located one mile southwest of the disaster, were sent home for the day; the pipeline traversing underground close to school property. Northwest Indiana Genealogical Society. 1995. Portage Township Cemeteries, Porter County, IN. Valparaiso, Indiana: Northwest Indiana Genealogical Society. Victoria Advocate, Victoria, Victoria County, Texas; August 5, 1931; Volume 33, Number 297, Page 2, Column 7; Column titled "Super Highway Under Way in Chicago Area." The Vidette-Messenger, Valparaiso, Porter County, Indiana; May 18, 1954; Volume 27, Number 269, Page 1, Columns 6-7. Column titled "Old Cemetery is in Path of Super Highway in Area. Relocation of Burial Land to be Sought." The Vidette-Messenger, Valparaiso, Porter County, Indiana; May 19, 1954; Volume 27, Number 270, Page 1, Column 5-6 and Page 6, Column 2. Column titled "Looks Like Toll Route May Have to Skirt Old Cemetery" by Fred Van Pelt. The Vidette-Messenger, Valparaiso, Porter County, Indiana; May 21, 1954; Volume 27, Number 272, Page 1, Column 5. Column titled "Old Cemetery to be Topic at Meeting. Two Toll Road Officials Plan Chesterton Visit." The Vidette-Messenger, Valparaiso, Porter County, Indiana; May 24, 1954; Volume 27, Number 274, Page 1, Column 4. Column titled "Are Opposed to Moving of Cemetery. People in North County Vicinity State Objection" by Lucille Marshall. The Vidette-Messenger, Valparaiso, Porter County, Indiana; Mary 24, 1954; Volume 27, Number 274, Page 1, Column 4. Column titled "Leave for Chesterton." The Vidette-Messenger, Valparaiso, Porter County, Indiana; May 25, 1954; Volume 27, Number 275, Page 1, Columns 7-8 and Page 6, Column 3. Column titled "Cemetery Bypass Seems Likely. Relocation Cost Set at $100,000" by Fred Van Pelt. The Kane Republican, Kane, McKean County, Pennsylvania; May 26, 1954; Volume 60, Number 216, Page 1, Columns 2-3. 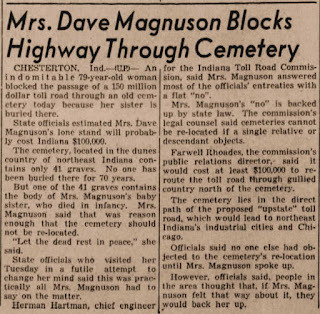 Column titled "Mrs. Dave Magnuson Blocks Highway Through Cemetery." The Vidette-Messenger, Valparaiso, Porter County, Indiana; May 26, 1954; Volume 27, Number 276, Page 1, Column 5. Column titled "Revises Cost to Relocate Super Road. Cuts Down Estimate to $5,000 for Job in Porter County." The Vidette-Messenger, Valparaiso, Porter County, Indiana; May 27, 1954; Volume 27, Number 277, Page 4, Column 1. Column titled "James Cemetery." The Vidette-Messenger, Valparaiso, Porter County, Indiana; June 7, 1954; Volume 27, Number 285, Page 3, Column 3. Column titled "Illinois Woman is Opposed to Moving of James Cemetery." The Vidette-Messenger, Valparaiso, Porter County, Indiana; June 28, 1954; Volume 27, Number 303, Page 3, Column 5. Column titled "Field Work for Re-Locating Road Complete." The Vidette-Messenger, Valparaiso, Porter County, Indiana; July 12, 1954; Volume 28, Number 6, Page 4, Columns 3-5. Column titled "Readers' Views . . . On Subjects of Public Appeal. Toll Road Protest" by A. Victim." The Bakersfield Californian, Bakersfield, Kern County, California; March 9, 1955; Volume 68, Number 188, Page 1, Column 4. Column titled "Flashes. 4 Crewmen Killed." Pharos Tribune, Logansport, Cass County, Indiana; March 9, 1955; Page 1, Column 7-8. Column titled "Gas Pipeline Explosion Kills 4 at Chesterton." The Vidette-Messenger, Valparaiso, Porter County, Indiana; March 9, 1955; Volume 28, Number 209, Page 1, Column 8. Column titled "Area Gas Line Blast Kills Four. Three People Injured in North County." The Brownsville Herald, Brownsville, Cameron County, Texas; March 10, 1955; Volume 93, Number 215, Page 1, Columns 5-6. Column titled "Twenty-Four Die in Fires." The Daily Independent, Kannapolis, County, North Carolina; March 10, 1955; Volume 72, Number 59, Page 1, Column 2. Column titled "Five Perish in Gas Explosion." The Vidette-Messenger, Valparaiso, Porter County, Indiana; March 10, 1955; Volume 28, Number 210, Page 1, Columns 7-8 and Page 6, Column 2. Column titled "Gas Line Explosion Reaches Five; Cause Being Sought. The Times, Munster, Lake County, Indiana; June 15, 2013. Column titled "Women Look to Help Cemetery Rest in Peace." © Steven R. Shook. All Rights Reserved.